Following 9/11 in 2001, I had an article penned discussing the virtues of riding a motorcycle and how your bike is a form of escape from the everyday world. The nation was somber, fall settled in and I never ran it. A general economic cycle runs a ten year loop with the highest points usually mid-decade and its worst dips at the end of the present and beginning of the next decade. Last fall I saw the downturn coming. I penned up an article announcing what we might expect to see in the industry. It wasn't a happy picture. I shelved it. A look at how things have come to be as of late reminds me of these two unpublished works, so I'll lean on them a bit for inspiration as we take a look at the economic status of the motorsports industry as it stands right now. During the summer the price of gas went over four dollars a gallon and the economy is taking a dive for various reasons as you know. The price of gas has been an inspiration for many of us to ride our bikes a little more, taking what might be a leisure vehicle for many and making it the daily driver. Are you gonna keep it up into winter? Scooter sales exploded. It's a given. Look at every time the price of gas has gone over the next dollar mark. First time it happened was in the 1980s. Honda was there to reap the benefits selling containers full of Spree, Elete and Helix Scooters. Then gas went over two dollars a gallon in the 90s and again Honda was there along with Yamaha which made a killing on Riva sales. By the time gas hit three dollars a gallon in 2005, Vespa was in full swing with their new line of scoots, a hoard of Chinese built scoots were hitting our shores and Aprilia was cleaning up on the sales of 50cc scoots. But we never saw showroom floors go empty � why? Because, the rest of the economy was healthy for the most part. Now with a sour economy and gas having once-already gone over four dollars a gallon simultaneously the market is low on scoot inventory. Dave Richardson of Moto International reports he's had a 300% increase in scooter sales this year which has left his showroom empty of step-through two-wheelers. And it's not just new units, the used market is dry as well. What is available is going for over book in a number of cases. 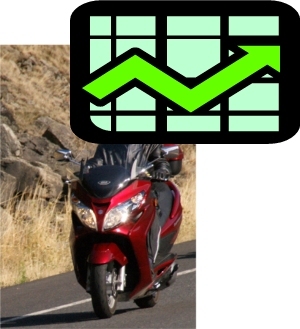 It's a great time to be selling a new or used scooter! Other low cc bikes are also in heavy demand, such as the Kawasaki Ninja 250, Honda Nighthawk and Rebel 250s and Yamaha's Virago 250, but since so few were produced over the last decade, these too are commanding top dollar on the used market. This is just one of the ways the motorsports industry gets through the tough times making some money. Selling those new units and servicing the used ones (which often need a deal of work to make them good runners) add to the bottom line during tough times. While one large volume dealer is cutting sales staff right now, they're ramping up techs in the backroom which is unheard of in the fall. This is also a time when independent service shops are overwhelmed. In general, summer is a busy time no matter what, so stack more bikes on the road on top of that and get in line for a service appointment. Since most OEM shops won't work on bikes twelve years or older, the phone lines light up at indie shops with customers trying to book time. That used scooter someone just bought turned out to be in not so great shape, but the wait will be several weeks while parts get ordered and other bikes get moved through the line. Some people get turned away from indie shops. Someone who comes in with a 70s model two stroke is likely to be advised to sell the bike for parts since it's not worth the money to make it run. If you insist on getting it fixed, you may pay a hefty retainer up front to get the work started. Older bikes can be a house of cards and smart indie techs will command the money on the front end for work unseen, refunding the difference back later if the bike needs less work than expected. And then there's the backlog for Motorcycle Safety classes. While many states have been increasing the number of classes available the supply still doesn't meet the demand. As long as the economy sags and fuel prices rise we'll see these areas of the industry flourish. But what areas won't? The days of selling lots of extravagant, one-off customs to customers who did well in the stock market or mortgaged their home are basically over for right now. If it's just a leisure toy someone wants, now is likely not the time they'll be making a purchase. Ditto for snowmobiles, dirt bikes and ATVs. Looking for a great deal on one? - There are many to be had. If an OEM has built their line to focus on larger cc bikes in general, these will be lean times. H-D's recent purchase of MV Augusta isn't the solution to what lies ahead for the motor company and its franchisees. Smart dealers who understand the economic cycle had been working down inventory for 18 to 24 months before the dip struck last fall. Others had not. Over the course of the next 12 months don't be surprised to see a few OEM shops around the Northwest disappear as a result of not being able to cover the flooring costs on their extended inventory. But it goes beyond the dealers. National rally events are taking a beating. Sturgis had a decidedly lower turnout this year and the BMW MOA Rally saw 5,000 attendees as opposed to the 7,000 we saw in Spokane in 2004. These events aren't going away, but being held on a smaller scale is probably in the cards over the next few years. Smaller start-up events that have been around only for a few years have seen smaller numbers or been cancelled all together. And a tough economy in general means tough days ahead for many of us. Figuring out how to make ends meet, keeping tabs on retirement accounts and getting along without luxuries like world travel and a third bike means many of us will want to escape. It all boils down to one thing - There's no better time to be riding a motorcycle. Taking advantage of the fuel economy, using the HOV lanes, escaping from reality by spending an afternoon in the twisties and seeing the world from two wheels. Aaaahhh � the life!